We want all babies to sleep safely. Each year, more than 3,500 U.S. infants die suddenly and unexpectedly. Many of these deaths occur in an unsafe sleep environment. The Alliance actively works to develop tools to enhance local efforts to promote a consistent and clear safe sleep message and other resources for professionals working with families. The tools and information below follow the American Academy of Pediatrics 2016 Recommendations for a Safe Infant Sleeping Environment. We want all families to follow the ABCs of infant safe sleep: alone, on the back, in a crib or Pack ‘n Play®, and in a smoke-free environment. Intended for parents and families with infants, this video provides an overview of safe sleep best practices from the perspective of a new mom. This video can be shown on its own, or in conjunction with safe sleep education. Sleep Baby Safe is a suite of trainings and resources developed by the Alliance in partnership with the Wisconsin Department of Health Services. These resources can be used by a variety of professionals who talk to families about safe sleep. 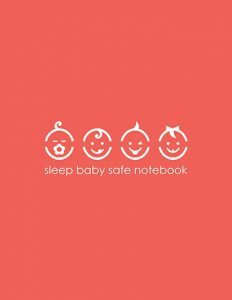 Intended for professionals who have taken the Sleep Baby Safe training, this notebook provides safe sleep data, recommendations and conversation starters. Our table talk sheets can be used as visual aids for families when discussing safe sleep practices. Available in several languages and ethnicities, just print the version(s) that best represents your family population. 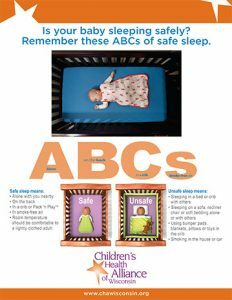 This resource covers the ABCs of safe sleep. It can be used as a handout for families or as a poster in public spaces. These online training modules were created as a refresher for the Sleep Baby Safe in-person training. The training provides safe sleep data, AAP recommendations and demonstrations. Take the post-training survey after watching all three modules to receive 0.5 hours of continuing education through The Registry. Children’s Health Alliance of Wisconsin supports the safe sleep efforts of public health departments and tribal agencies as part of its Maternal and Child Health grant objective in partnership with the Department of Health Services. The Alliance facilitates learning community calls held quarterly for agencies working on infant safe sleep. All calls are recorded and archived. Do you want to conduct a Sleep Baby Safe training in your community? Contact Amanda to schedule a train-the-trainer session. Then use these resources to conduct a safe sleep training with community members, professionals who work with families, child care providers or medical professionals. In partnership with Children’s Hospital of Wisconsin Foundation, the Alliance manages Newborn Nest, a baby box program that includes trainings, resources and a strong evaluation component. If your agency is interested in participating in the Newborn Nest program, please contact us. Local public health departments and tribal agencies throughout Wisconsin have created safe sleep resources for their communities. 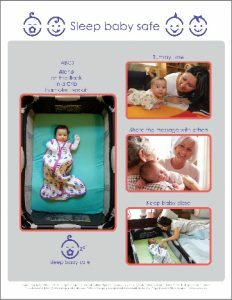 Feel free to use these examples when creating safe sleep materials for your own community. If you would like to connect with the teams who created these resources, please contact us. Receive monthly updates on safe infant sleep. Sleep Baby Safe is funded in part by the Wisconsin Department of Health Services, Division of Public, MCH Title V Services Block grant through the Health Resources and Services Administration, Department of Health and Human Services.